Panama – officially, the Republic of Panama (República de Panamá) – is the southernmost country of both Central America and, in turn, North America. Situated on the isthmus connecting North and South America, it’s bordered by Costa Rica to the northwest, Colombia to the southeast, the Caribbean Sea to the north and the Pacific Ocean to the south. The capital is Panama City. Panama is an international business centre and it has the largest economy in Central America, followed by Guatemala, Costa Rica, and El Salvador. It’s also the fastest growing economy and the largest per capita consumer in Central America. The Panama Canal is a ship canal that joins the Caribbean Sea to the Pacific ocean. One of the largest and most difficult engineering projects ever undertaken, it has had an enormous impact on shipping between the two oceans, replacing the long and treacherous route via the Drake Passage and Cape Horn at the southernmost tip of South America. The Panamanian currency is officially the balboa. In practice, however, the country is dollarized; Panama has its own coinage but uses U.S. dollars for all its paper currency. Panama City is known as a "shopper's paradise". It features large shopping districts as well as modern shopping malls, such as the Multicentro Mall, Multiplaza Pacific Mall and the Albrook Mall. A traditional Panamanian craft is the Mola. While in Panama city don´t miss the four "must do": the Panama Canal, Panama Viejo, Casco Antiguo (also known as Casco Viejo) and the jungles surrounding the Canal area. Temperatures range from 32°C during the daytime to 21°C in the evening practically year-round. Humidity is always high at about 80 percent. The rainy season takes place between October and November, and the best months to visit are mid-December and late March. One of the largest and most difficult engineering projects ever undertaken, the Panama canal had an enormous impact on shipping between the two oceans, replacing the long and treacherous route via the Drake Passage and Cape Horn at the southernmost tip of South America. The town of El Valle is located in the flat, wide crater of an extinct volcano.Because of its elevation, it is cooler than the Panamanian lowlands. Natural attractions near El Valle include the Chorro El Macho waterfall, the smaller waterfall Chorro Las Mozas, "square"" trees behind Hotel Campestre, and a group of small thermal pools. " The area is probably the most colorful part of Bilbao, including many shops and taverns, several historical churches (San Antón, Santos Juanes, the Cathedral, San Nicolás), the largest food retail market of Europe (Mercado de la Ribera), the public Arriaga Theatre, the seat of the Academy of the Basque Language (Euskaltzaindia) and a public library. The Metropolitan National Park, created in 1985, is 10 minutes from Panama City centre , and is within the city limits. Metropolitan National Park offers rooms for meetings and audiovisual presentations: It has a shop that sells conservation items, an orchid site, trails from which you can view the city and the Panama Canal, and a library. Taboga Island, Panama, also known as the "Island of Flowers,"" is a volcanic island in the Gulf of Panama. 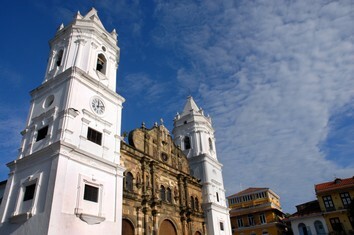 It is the site of Iglesia San Pedro, claimed to be the second oldest church in the hemisphere. The island is famous for its beautiful beaches, crystal clear waters, soft sands and a wildlife refuge. " The Chiriqui highlansa are primeval rainforests bedecked with clouds, noisy, chattering birds flash brilliant iridescent colors as they dart about their daily chores, flowering epiphytes bloom en masse high above the forest floor while gurgling streams glisten and tumble hurriedly over great boulders in their dance towards the sea. The Bocas del Toro Archipelago is close to the border with Costa Rica. The islands offer the visitor a number of attractions like luxurious rain forests with an abundance of fauna and flora, sunny islands, beaches that compete with the Caribbean best, coral reefs in crystal clear water and a national marine park.